I'm a longtime fan of of Ricardo Ettore's TypeIt4Me text macro utility, without which my problems with typing pain would be much more difficult to work around. TypeIt4Me is a keystroke activated text macro application that allows you to define a set of abbreviations to trigger automatic entry of blocks of specified text, which may be a short as a single word or as long as you wish. When you type the abbreviation (or select it from TypeIt4Me's pop up menu) and hit the assigned trigger keystroke(s), the Mac expands the entry as you continue typing. This is especially useful for entering frequently used phrases and other boilerplate stuff like your email address. For example, I frequently type my name, so with TypeIt4Me I have assigned it the abbreviation "ch." Now when I type "ch" and stroke the spacebar, the two letters change to "Charles W. Moore." You can also use TypeIt4Me to apply long passages of text. I'm so used to depending on it it that I find it hard to adjust to using a computer that doesn't have TypeIt4Me and my library of macros installed. Originally published in 1989, TypeIt4Me won the 1994 MacUser Shareware Award for Best Publishing Tool and has become a classic must-have program for anyone who does a lot of typing on their Mac. It was Mac pundit and author David Pogue, who suffers from carpal tunnel syndrome, who first brought TypeIt4Me to my attention in the mid-90s. Pogue says that it cuts the amount of typing necessary for him by 25%. It also streamlines operations remarkably, especially when your hands and arms are hurting and every keystroke is an adventure in pain, as I know all too well. Unlike, say, Microsoft Word's autotext, TypeIt4Me's big advantage is that it works in every application or text field. There are other utilities that support text macros, but for many years I never found anything that I like as well as TypeIt4Me (now at version 2.2.2). A big advantage of TypeIt4Me for me is that I find it much easier to remember macro abbreviations that I make up myself than I do memorizing prescriptive keyboard combinations. 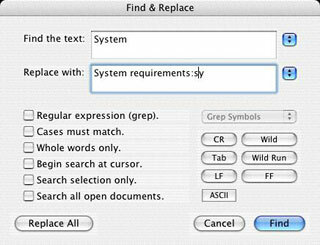 However, since last summer there's been a new kid on the block: a text macro utility by Peter Maurer called Textpander (now at version 1.2), which offers TypeIt4Me-like features, adds a few new interesting wrinkles of its own, and has a preference panel interface that some may find more convenient and intuitive than TypeIt4Me's menu selections - as well as being freeware/donationware as opposed to TypeIt4Me, which is $27 shareware. Insert standard greetings, text fragments, and signatures - including formatted text and pictures. Use editor-independent code templates and have Textpander position the cursor just where it needs to be. Type special characters without having to launch any special characters palette. Have Textpander correct typos automatically. Just about anything else you need to type often. I tried out the first public release of Textpander (Version 1.1) and liked it in many respects. One Textpander feature I especially like is that it can be configured to play a sound when a macro is applied. I'm not a touch typist, and I often type while looking at the keyboard or hard copy I'm transcribing rather than that the screen, so sound notification provides a heads-up if a macro is inadvertently applied. As with TypeIt4Me, you can also exclude specific applications from Textpander entries, which can include plain or formatted text, or even pictures. A convenient Textpander feature is its ability to import or "subscribe to" existing TypeIt4Me (and Typinator, another text macro utility) macro/snippet libraries - at least theoretically. 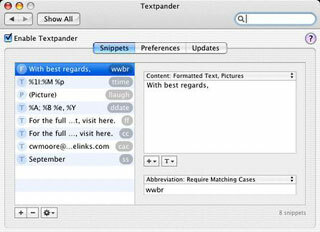 Unfortunately, in practice with Textpander 1.1 I found that while most of the imported snippets worked, some were truncated, necessitating the cumbersome workaround of configuring them in Textpander's own snippet library and creating and memorizing new, alternate abbreviations to trigger them. This isn't a biggie if you're starting from scratch, but I have over 100 TypeIt4Me macros. However, a more serious issue related to snippet subscription in version 1.1 was that applying macros from TypeIt4Me in Textpander resulted in an invisible upside down question mark (hex value \x00) character being inserted in the text of your document - and that could cause a real problems, especially with HTML markup, for which I use text macros extensively. The pesky little upside down question mark characters were only being inserted by imported TypeIt4Me macros (which still worked fine in TypeIt4Me) and did not appear with native Textpander snippets. However, the problem was serious enough that I stopped using Textpander early on and went back to good, old reliable TypeIt4Me. When Textpander 1.2 was released a month or two ago with a bug fix that claimed to have fixed its external snippets parser, I was eager to check it out. Happily there were no more unwanted invisible characters being inserted with applied macros in version 1.2. However, the macro truncation issue was still there in some of the imported TypeIt4Me macros. Speed was improved. Also, unlike the OS X versions of TypeIt4Me, with which I've had persistent "misfire" problems with some macros, such as iBook, Pismo, and PowerBook, that seems not an issue with Textpander, even though those macros are imported. As it turned out, I switched to Textpander to try out Version 1.2 and was so comfortable with it that I never got around to switching back. One residual bug that still needs squashing is that in the Tex Edit Plus Find & Replace dialog, Textpander inserts the macro abbreviation after the entry. I haven't encountered this elsewhere, and it's annoying, but not a deal-breaker. I like Textpander's three-panel preference pane, which is the only user interface for the program aside from the menu bar menulet. The program is very light on documentation (there isn't any), but fortunately the configuration options are pretty intuitive. You also have the option of having text macros applied as you type or only after a delimiting keystroke, which you can also specify to be retained or deleted after the macro is applied. I opted for the delimiting keystroke configuration, sticking with the spacebar as with TypeIt4Me. Textpander Is activated/disabled using a check box on the preference panel, which is positive and convenient. If you have both Textpander and TypeIt4Me installed, you need to disable one or the other so you don't get double-entries (that is, if you have Textpander subscribe to TypeIt4Me's macro library). 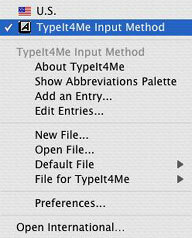 TypeIt4Me, incidentally, is activated/disabled in the International preference panel, which is not an intuitive location. Last week, Peter Maurer released Textpander 1.2.1, which as the hundredth-point version update indicates, is basically a minor nip and tuck clearing up a few rough edges and adding a bit more functionality and convenience. The snippets list now supports copy & paste. In addition to the obvious purpose of duplicating snippets (which was already possible by doing an [option]-drag, by the way), you can also create new snippets by pasting text to the snippets list. 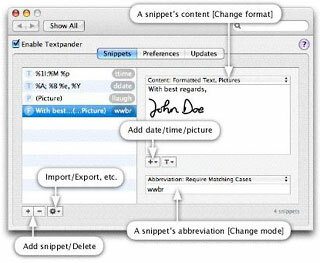 Moreover, copying from the snippets list populates your clipboard with a list of the selected snippets and their respective abbreviations. 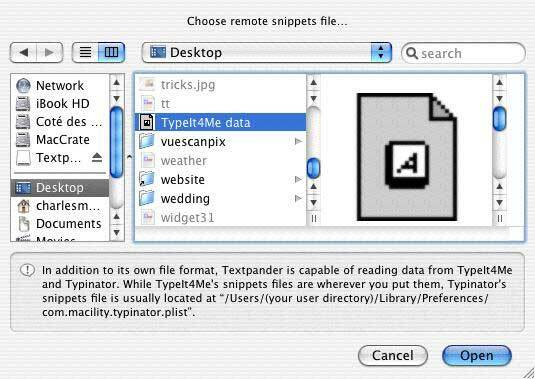 Paste that into a text file and apply your formatting to create a snippets cheat sheet. Textpander now works with iTerm. Available Languages: English, French, German. Textpander can now import or subscribe to "nlang" files from Nisus Writer. 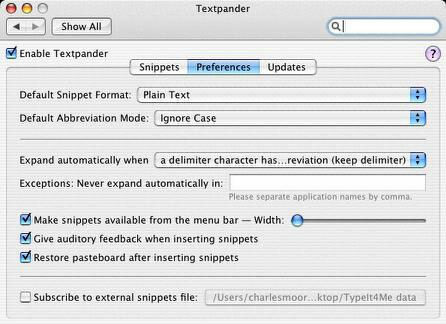 Textpander Help should now work on Mac OS X 10.3.9. After using it continuously for more than a month, I can affirm that Textpander is capable of filling the text macro role very satisfactorily, even for a heavy text macro user like me. I still like TypeIt4Me, which is a mature application that works extremely well and has a strong track record. TypeIt4Me also supports all versions of OS X 10.3 Panther (version 2.2.2 no longer supports 10.2 Jaguar), while Textpander wants OS 10.3.9 or later, which might be the deciding factor for some users. Of particular interest to many Low End Mac readers, TypeIt4Me is also available in a Classic version that supports OS 8/9. You can switch back and forth between OS X and Classic, sharing the same abbreviations file, and even edit it on either side. Since you can try both programs out without making any cash commitment, my advice would be to sample them both and decide which one you like best. TypeIt4Me X is $27 shareware.